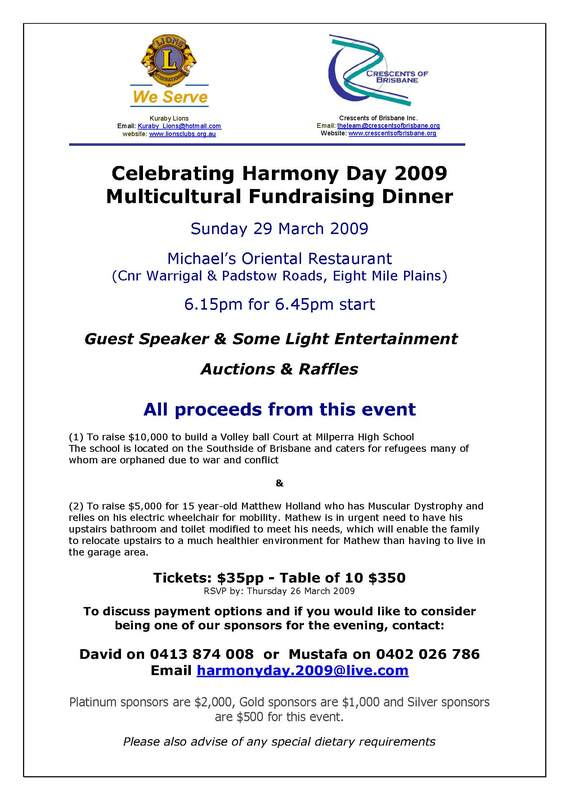 The Multicultural Harmony Day Dinner to raise funds for the Milperra State School and Mathew Holland was attended by some 200 people representing a number of different communities. Held at Michael's Oriental Restaurant the event was put together by Crescents of Brisbane and the Lions Club of Kuraby and was well supported by the local Muslim community. For the new Minister for Disabilities and Multicultural Affairs, Annastacia Palaszczuk MP, the occasion was a baptism of fire as both roles of her portfolio were the centre of focus on the night but the keynote address she delivered gave an early indication that she was up to the task. A long list of prominent local politicians, community leaders and businessmen was also present with Brisbane's Deputy Mayor, Councillor Graham Quirk also displaying extraordinary auctioneering skills with his trusty gavel. A very engaging young Mathew brought a tear to an eye or two as he thanked everyone for the support he was being given. Ms Tania Balil-Lozoya, a music therapist at the Milperra school, was a delight to watch and listen to as she sang native Spanish songs on her guitar through the evening. Ms Adele Rice, Principal of the Milperra State High School, spoke passionately and in glowing terms about her pupils, many of whom had arrived in Australia deprived of any previous education having suffered war and family loss. She also acknowledged the work of her dedicated staff and volunteers who helped out at the school each week. But the coup de grace arrived at the end of the proceedings when Mr Peter Carroll, President of the Sunnybank Community & Sports Club and and his General Manager Mr Michael Callaghan handed Anna Holland (mother of Mathew) the keys of a Toyota ..... registered in her name. Ms Susan Al-Maani and Mr. Faisel Essof (left) presented a cheque of $12 606.60 to the Executive Director of Muslim Aid Australia Mr. Iman Partoredjo (right) on behalf of the Muslim Community of Queensland who contributed to the Victoria Bush Fire Appeal.